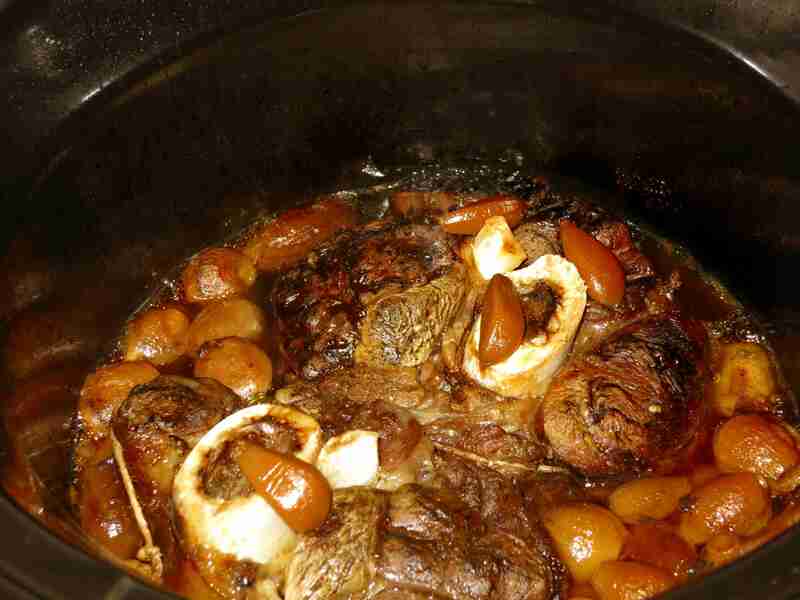 I love the crock pot, slow cookers, and dutch ovens. They make a great way to put together a meal in the morning, do a little planning, perhaps program the stove, and leave it alone until you’re ready for dinner. And best of all, as you come and go from the house throughout the day, you’ll be greeted each time you enter the front door with the smell of your dinner! There is just nothing like the anticipation of a meal that the delicious smells of a roast filling the house! Let the Shank Steak marinate in the rum (or your preferred marinating alcohol) overnight. Ok, I actually prefer Shank Steak for this meal. I like many different roast cuts, and they all have their different meals. This one, though, is special. When a Shank Steak is marinated in alcohol, then slow cooked for several hours, the muscle portions fall apart about the bone, becoming bite sized (or slightly larger) goodness! I’ve done this roast with a shank steak twice in the past month, and both times have come out phenomenal! Obviously, this second time I recorded it to share with you! 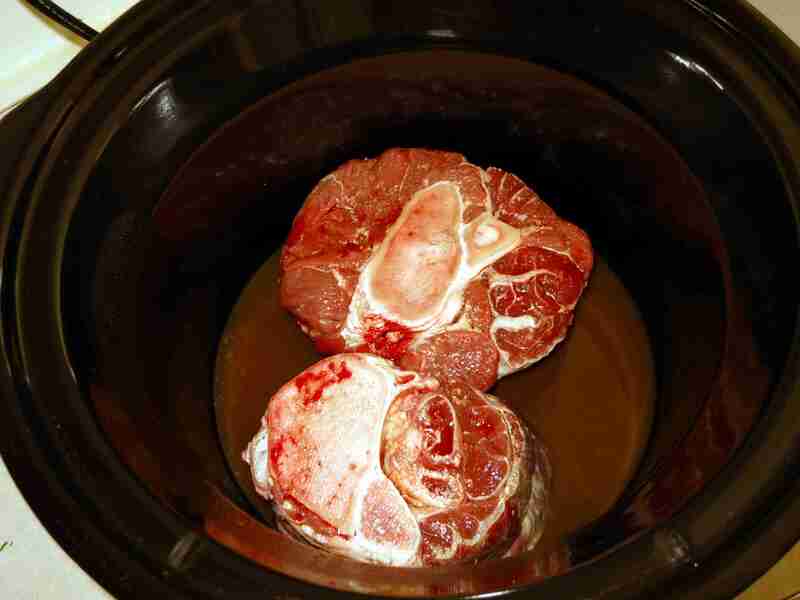 I n the morning, no less than 6 hours before the meal, put the shank steak and marinade in the crock pot and turn on to it’s highest setting. The high heat will heat up the pot faster. We’ll be turning it down to it’s lowest cook-setting (mine has a “Keep Warm” setting that I’ll be avoiding for this meal) after we add a few more ingredients. While the pot heats up, add the garlic and onions. 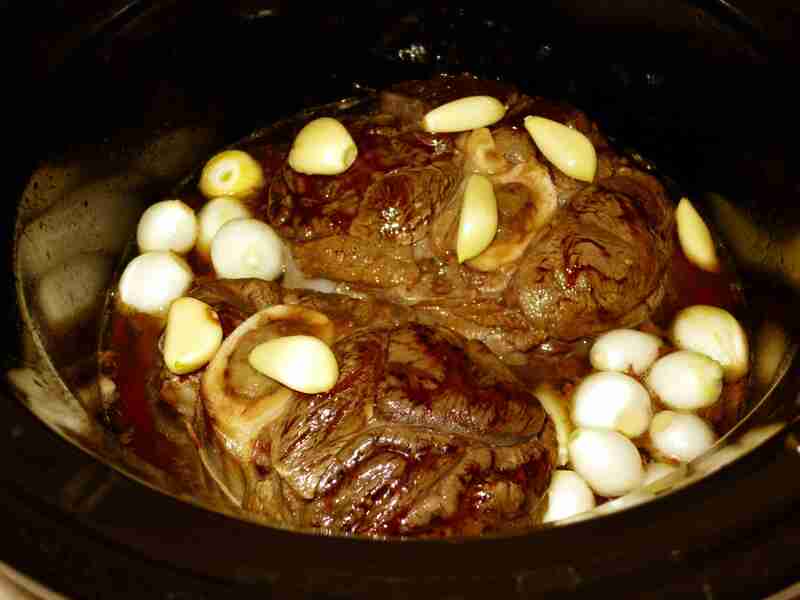 So, with the crock on high, I first peel the garlic cloves, and set them on top of the steak. If you’re terrified of eating this without salt and pepper, now is the time to add it. 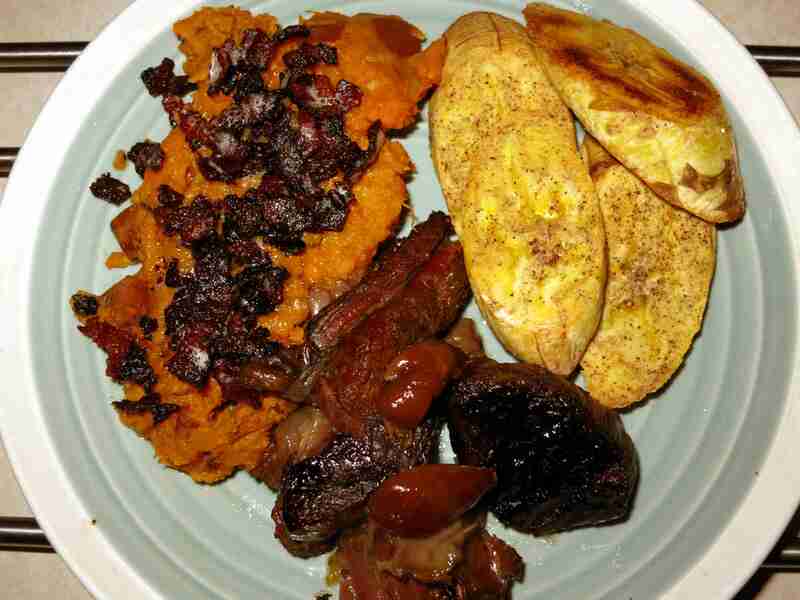 But the Shank Steak has plenty of flavor all by itself, so be sparing with your spices. Similarly, I often add turmeric and/or italian seasoning to my roasts, and this is again the time to add it. Put the garlic cloves on top of the steaks, so that as the steaks cook, the steam of the cooking will share some of the garlic flavor with the steak. These are whole, so they won’t be too overpowering, even with a half-heel of garlic. Cut and peel the onions as well, putting these along side the steak so that they will cook in the juices of the steak and marinade. The onion flavor will get strong during the cooking process, and one of the ways you know that the steak is ready to eat is when the onion scent has been replaced by the steak scent! Now turn the pot down to low, and let cook for several hours. This process takes hours. And as I mentioned above, you’ll know it’s getting close to done when the smell of the meat has overpowered the smell of the onions. I love the smell of cooking onions, especially stewed onions, so the smell brings a smile to my face. But when the shank steak starts to be ready, the smell of that stewed beef is amazing! Serve the Shank Steak with tongs – the tender meat has already separated and will need to be lifted out one bite-sized piece at a time. I would serve the sides first. The steak is steaming hot, and delicious to eat that way. 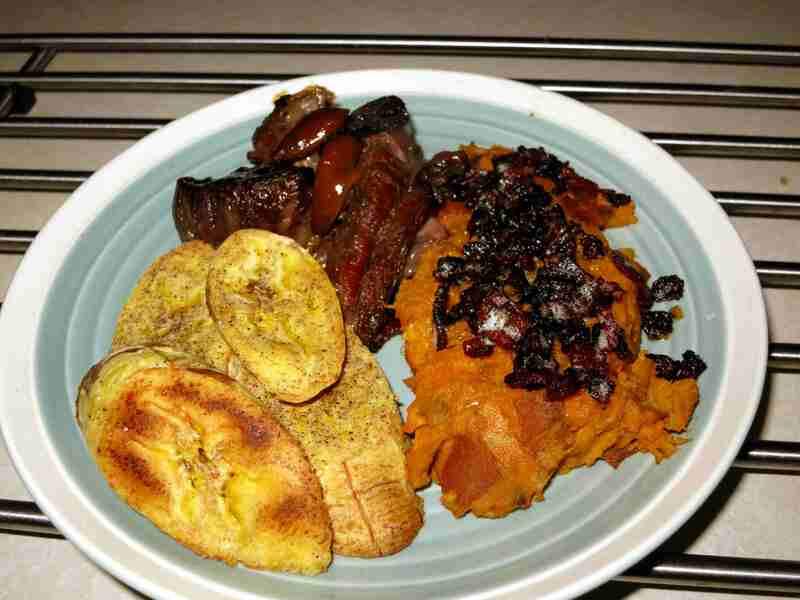 I ate this with baked spiced plantains (garlic and black pepper), my Bacon Mashed Sweet Potatoes, and the stewed onions, which came out sweet and delicious! For more Urban Paleo Chef recipes, be sure to check the Recipes page, and for complete Paleo meals keep your eyes one the What’s For Dinner? page! Thank you for the invitation! Next time I drop by, I’ll be sure to be early enough to help out in the kitchen! Thanks UPC…I’ll be looking for shank steaks next! This may be a silly question but do you white or dark rum? Shank Steak is a funny cut – in my opinion, it’s no good for a “steak” style meal, nor would it be much fun on the grill. But when you roast it, the true value of this particular cut comes out! It goes in as a steak, and comes out more like a sirloin-roast, pre-sliced. It’s really quite exciting, and it takes flavor amazingly well! I am most definitely a dark rum guy! I really prefer the flavor of the extra aging that a dark rum gets. Don’t misunderstand, though, I am not suggesting cooking with spiced rum – just the highest quality you can stomach cooking with (let’s be honest – I have some rum I wouldn’t cook with either… it’s just too expensive!). Your cookbook will be awesome…did I just start a rumor??? What? Cookbook? Where did you hear that? !